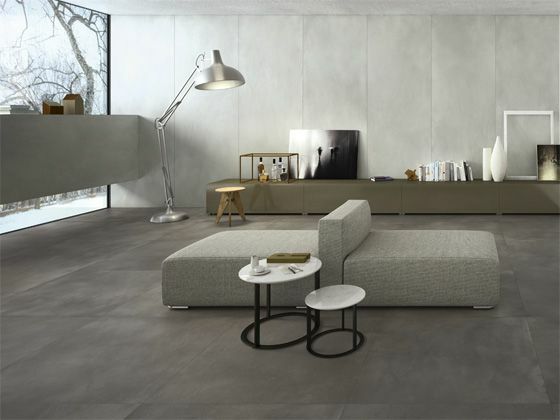 Porcelain for floors and walls in the 300x150 and 300x100 sizes. 4.50m2 ULTRA slabs set the new standard for architects in all projects where size makes the difference. ULTRA offers extreme flexibility for design and the freedom to make your ideas reality with large size. ULTRA is only 6 mm thick, guaranteeing lightness and strength for all applications, even those you haven't thought of yet! What can you do with Ultra? Interior and exterior decorating solutions with large slabs. There are technological moments in which a product makes the leap to being state of the art and changes our life style. For example, it was so for the automobile, the television, the Internet and smartphones. Large Slabs Marble Effect - Available in 26 colours and 3 finishes. 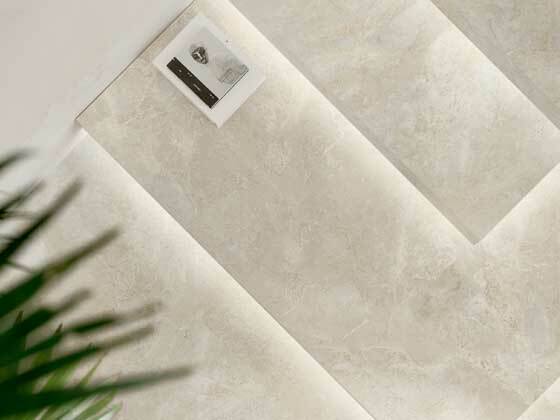 The exceptionality of its luxury combines with the light weight of the large size in the minimum thickness to conquer an excellence in flooring and coverings of surfaces both large and small. Large Slabs Marble Effect - Available in 8 colours and 3 finishes. Large Slabs Cement / Resin Effect - Available in 5 colours. Discover the complete range of Ultra CON.CREA. Brilliant, sophisticated and incisive, this is how the Ultra Metal collection looks. 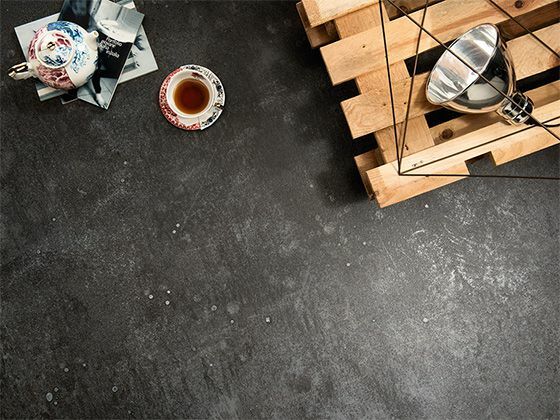 It embellishes the world of big slabs with a new aesthetic power, inspired by the properties of the metals. Large Slabs Metal Effect - Available in 5 colours. BLEND.HT, a product with ancient charm but with a HIGH TECH soul. Large Slabs Stone Effect - Available in 5 colours and 2 finishes. 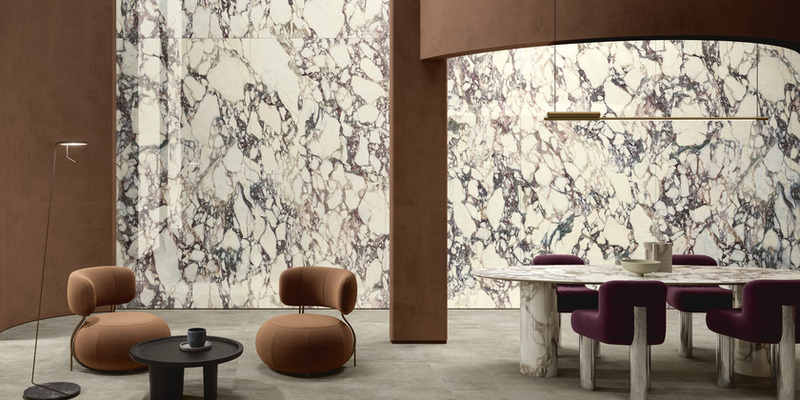 The Teknostone collection simultaneously reinterprets the stone materials’ pure and refined character, finding the right response in its essentiality to current architectural and design requirements. Large Slabs Stone Effect - Available in 4 colours. 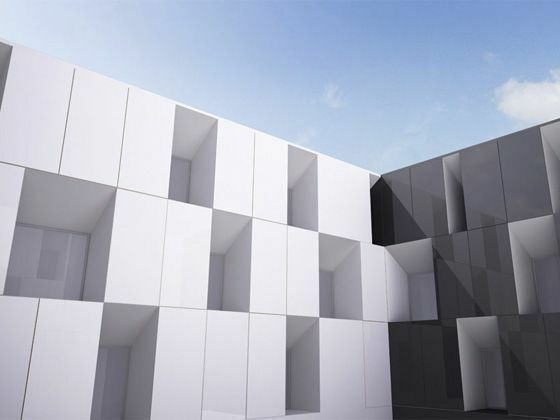 Ariostea is extending Pietre's family based on Ultra technology. 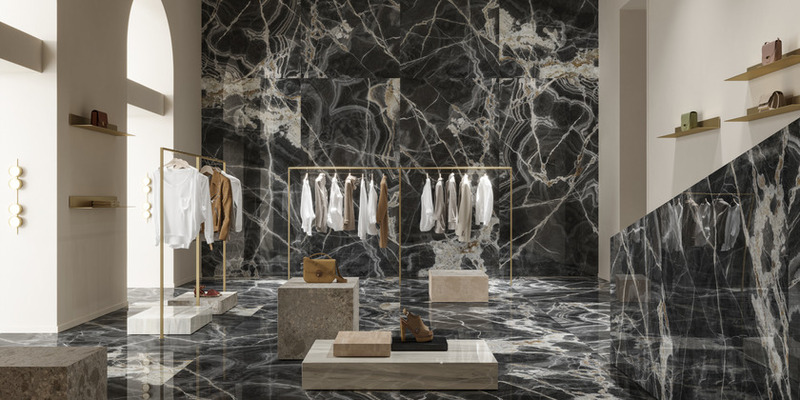 Very fine 6 mm thick slabs evoke brutality and elegance of Limestone and effusive volcanic rocks with a variety of patterns and stratification hard to find in extraction rocks. Large Slabs Stone Effect - Available in 8 colours and 3 finishes. With its area of 4,50 m2, Ultra is the new industry standard for project designers and for all projects where dimensions make the difference. Large Slabs Design Effect - Available in 2 colours and 2 finishes. Ultra technology lead up to create structured surfaces in large size with the aim of transmitting soft sensations to sight and mellow to touch. 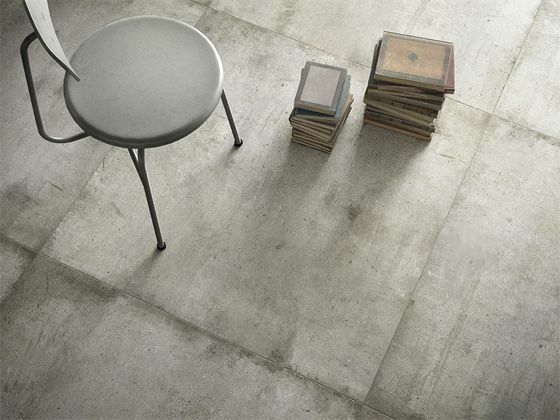 Large Slabs Cement / Resin Effect - Available in 4 colours. 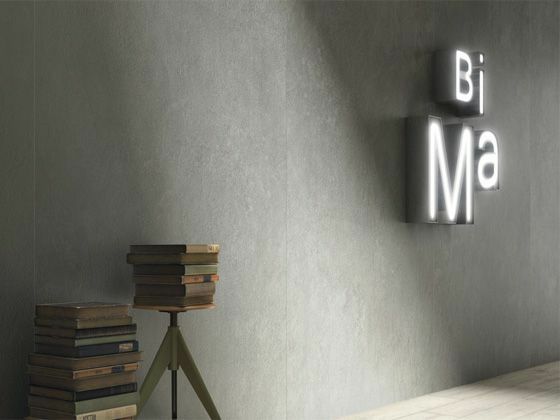 The answer is up to your creativity: the flexibility of ULTRA technology allows the product collections developed by Ariostea to be adapted to generate projects ranging from ordinary floors and walls with large and small surfaces to application to furniture and accessories. You can now create manufactures and installations based on a new concept of lightness and performance, thanks to the superior quality of ceramic technology. 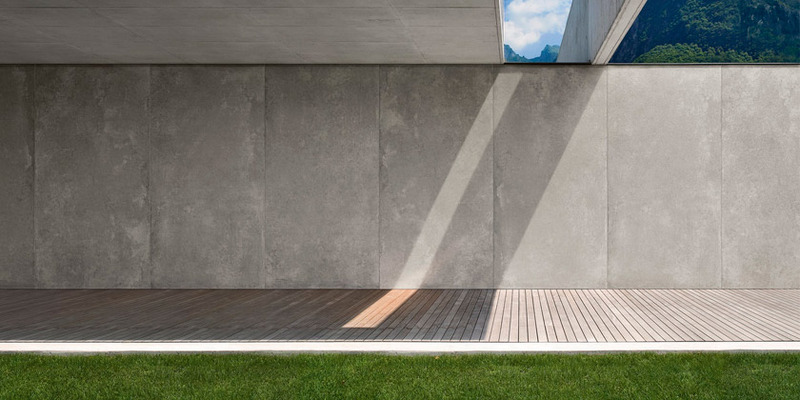 The material's very nature allows the architect to express all of these possibilities in indoor and outdoor spaces, creating uninterrupted, curved and even backlit surfaces.